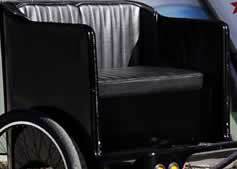 Welcome to the online home of Roger Rickshaw, Chicago's Premiere and Original Pedicab Company. Whether you're looking for a fun ride home from a game or event, a romantic cruise, or a truly sustainable corporate marketing alternative, we've got your cab! Roger takes pride in Chicago, and has been providing exemplarity service and safe transport toward a livable city since 2001, with literally thousands of trips in every corner of the city. With dozens of cabs and the best riders in the Chicago, we have what you need in a pedicab experience! Our reputation for excellence extends to weddings, corporate events and just plain sustainable FUN. Contact us today or flag us down and go for a ride we guarantee you'll enjoy. Join us and the Mayor in our quest toward making Chicago the world's greenest city!